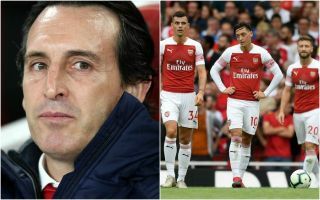 Arsenal boss Unai Emery will hope to continue to stamp his mark on the squad this summer, and it could reportedly involve two exits. The Spanish tactician arrived at the Emirates last summer to replace Arsene Wenger, and made several additions to the squad to mould it into his own. After a limited January transfer window in which Denis Suarez was the only notable new arrival in a loan deal from Barcelona, the summer could be crucial in allowing Emery to continue the process of building his own squad in north London. With that in mind, The Mirror suggest that exits are on the cards, which in turn could create space for new signings. It’s reported that Mesut Ozil is being forced out by being snubbed by Emery, as he continues to struggle for regular playing time. Meanwhile, it’s added that with Danny Welbeck’s contract set to expire at the end of the season, he could find himself at Crystal Palace this summer as they could choose to snap him up on a free transfer. Given his injury woes over the years, it’s understandable if Arsenal do opt to let him go, as for a club looking to compete on multiple fronts each season, they need quality depth available and Welbeck has seemingly been unable to provide that on a consistent basis. As for Ozil, the 31-year-old has struggled with injuries of his own so far this season, but even when fit, he hasn’t been able to cement his place in the starting line-up. That was evident in the last three games, as he’s been left on the bench by Emery for two of them, against Chelsea and Manchester City. In turn, that would suggest that the former Sevilla boss isn’t comfortable playing the German playmaker in the big games, and while it’s arguably a little bit of a stretch to suggest that Ozil is being forced out, being snubbed by his boss will surely force him to consider his own future.